Coal is a brown-to-black combustible rock that originated from peat deposits in large swamp environments, through their burial to great depths and over a few hundred thousand to tens of millions of years. During burial peat is converted first into lignite, then subbituminous and bituminous coal, and, uncommonly, anthracite. Due to the loss of moisture during burial (peat has about 90 percent in its natural state, bituminous coal as little as 2 to 3 percent) and the chemical changes in the plant material that are induced by the rising temperature during burial to thousands of feet (increased carbon and decreased oxygen contents in particular), the heating value of coal increases significantly from peat to lignite and on to bituminous coal and anthracite. The various environments that prevailed in the peat swamps (e.g., forests with large trees; marshes with sedges, grasses, and reeds) produced various kinds of peat and thus coal with significantly different properties. The major coal types—banded, nonbanded, and impure coal—are easily recognizable. Banded coals are most common. In subbituminous and bituminous coal the bands are composed of vitrain (shiny, glassy, brittle), clarain (bright luster, tough), durain (dull luster, hard), and fusain (charcoal-like, soft). Under the microscope, the so-called macerals become visible. Many of these clearly reveal their plant origin (e.g., sporinite, cutinite, resinite, alginite), whereas others have lost much or all of the plants' original cell structure (e.g., vitrinite, collinite, inertinite, semifusinite). Coal is recovered from the ground either by underground or surface mining. Underground mining creates voids over many square miles. Two basically different methods are used: longwall and room-and-pillar mining. In longwall mining all coal is recovered from the mined panels; hence, subsidence occurs at the surface almost immediately and it is planned for. Room-and-pillar mining leaves about half of the coal in the ground as pillars to support the surface and prevent subsidence. However, subsidence may still occur because coal pillars or the floor strata under them fail, sometimes decades after mining (this sort of unplanned subsidence is a significant problem in major coal-producing states of the past). Subsidence causes damage to structures and interferes with the drainage of surface water; it may also impact aquifers. Coal left in the ground may catch fire, for example, through spontaneous combustion. Mine fires are difficult to control; some have burned for decades, even centuries. They can cause considerable local pollution, as well as other problems. Coal also always contains methane (CH 4 ), most of which is released into the atmosphere during mining. On the average, the deeper a mine, the more methane it generates. Methane is a very potent greenhouse gas and contributes to global warming. Another significant environmental problem is related to underground mines that operated above the local drainage level. The mine workings collect and conduct water that oxidizes the ever-present pyrite (FeS 2 ) in coal-bearing strata and causes acid mine drainage into the local drainage system. This is a common problem in the mountainous Appalachian coal fields where many old mines were operated at shallow depth above valley floors. For surface mining, large machines are used to remove all rocks and/or soil above the coal bed or beds to gain access to it or them (usually at depths of less than 150 to two hundred feet). Any surface drainage and aquifers in the overburden will be severely impacted within the vicinity of the mine pit. Also, the fertility of agricultural land becomes a concern. Modern mining laws require the careful monitoring of groundwater at mines and the restoration of proper drainage and fertility to farmland, to its premining levels, through reclamation . Contaminated water (e.g., water containing suspended fine solids and/or dissolved minerals) may run off the open pit and must be treated before release into the local drainage system. Modern mining laws seek to remedy or minimize the above-mentioned environmental and other problems related to the mining and cleaning of coal, as well as many other related concerns. 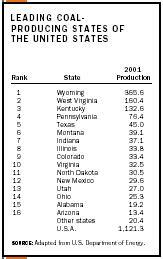 See the table for a listing of the top producers of coal by state. Adapted from U.S. Department of Energy. SOURCE: Adapted from U.S. Department of Energy. Many mined coals, especially from eastern and Midwestern coal fields, contain significant mineral matter in their raw mined state—up to about half by weight—and they are cleaned before sale. Preparation plants, capable of cleaning or processing several million tons of coal a year, generate large quantities of refuse that must be disposed of locally, safely, and in an environmentally sound manner. The materials rejected by a cleaning plant tend to be enriched in iron sulfides (FeS 2 : pyrite and marcasite) in particular; these oxidize easily into sulfates, causing the acidification of any water that percolates through and exits from refuse piles; acid water in turn tends to dissolve various other minerals, creating products that are potentially harmful to plants, animals, and humans. Cleaning plants always reject some coal, together with the incombustible material; spontaneous combustion can cause refuse piles to catch fire, which emit pollutants and are difficult to control. Coal, due to its origin from plants, is composed primarily of the "organic" elements carbon (C), hydrogen (H), oxygen (O), nitrogen (N), and sulfur (S). Whenever coal is used, it eventually ends up being burned, either through direct combustion in boilers, for example, those in large electric utility power plants, or after conversion into intermediate products like coke . Of all the oxidation products of these elements, carbon dioxide (CO 2 ) has become a major concern because it is a powerful greenhouse gas that accumulates in the atmosphere and is considered the primary cause of global warming. Sulfur and nitrogen oxides (SO 2 , NO x ), when released into the atmosphere from power plants, become a human health hazard and lead to the formation of acid rain downwind. This has been an important social and political issue for several decades, and various laws have been enacted that force power companies to limit the emission of sulfur and nitrogen oxides. All "new" (since 1970) electric power plants must remove most of the SO 2 from their flue gas, using various types of scrubbers . A cost-effective way to control SO 2 total emissions has been emissions trading, the federal government's decision to award a limited number of SO 2 "pollution allowances" to utilities that they are permitted to trade; this allows industry to decide at which plants it is most cost-effective to add scrubbers. The 1970 Clean Air Act (CAA) exempted existing power plants from this requirement, assuming that they would be shut down in the near future. To close this loophole, the 1977 CAA amendments established the "new source review" process (NSR), which requires a careful review of any changes performed in "old" (pre-1970) plants to determine whether they represent "routine maintenance, repair, and replacement" or a significant upgrading in which the plant would become subject to the same rules as new plants. Over the years these reviews became highly controversial because of the gray area between "routine maintenance" and "significant upgrading." In response, after a multiyear review process, the U.S. Environmental Protection Agency (EPA) proposed revisions of the regulations in late 2002, intending to overcome these widely recognized problems, provide greater flexibility for power companies to improve old plants, lead to increases in energy efficiency, and decrease pollution. However, environmental and political groups have challenged the proposed new regulations. One proposal to resolve the controversy would be to abolish the NSR process entirely and expand the pollution allowances trading system to old power plants. By capping the number of allowances over time, total pollution could be further lowered. Besides these major elements, coal always contains a large number of other elements in minor and trace amounts. Some of these are highly toxic, for instance, mercury (Hg), arsenic (As), cadmium (Cd), lead (Pb), selenium (Se), and uranium (U). Because coal is burned in such large quantities, primarily to generate electricity (nearly a billion tons in the United States alone! ), even trace amounts add up to large quantities being released into the atmosphere. The 1990 Amendments to the Clean Air Act identify 189 hazardous air pollutants (HAPs), eighteen of which are associated with coal. Of particular concern are those elements that form volatile compounds during coal burning and are carried into the atmosphere with the flue gas. The 1990 amendments require the EPA to study the health effects of HAPs and develop appropriate regulations for their control. Even cleaned coal still contains incombustible minerals (about 5 to 15 percent by weight) that are converted into ash when coal is burned at very high temperatures. Some ash particles are small and light enough to be carried up tall chimneys into the atmosphere with the flue gas (fly ash). Most power plants are required to remove fly ash from flue gas, using bag houses or electric precipitators. Both methods are highly efficient. However, tiny particles ( PM-10 ) may still escape. Because of their potential harm to humans, they have been targeted for regulation in recent years. Coarsergrained ash remains at the bottom of boilers (bottom ash); it is removed and disposed of nearby. Fortunately, this material is rather inert and of limited environmental concern. SEE ALSO A CID R AIN ; A IR P OLLUTION ; C ARBON D IOXIDE ; E LECTRIC P OWER ; E MISSIONS T RADING ; F OSSIL F UELS ; G LOBAL W ARMING ; G REENHOUSE G ASES ; M ETHANE ; NO x (N ITROGEN O XIDES ) ; P ARTICULATES ; S CRUBBERS . ASTM. "Standard Classification of Coals by Rank," Standard D388. In Annual Book of ASTM Standards, Vol. 05.05. New York. ASTM. "Standard Terminology Relating to Megascopic Description of Coal and Coal Seams and Microscopic Description and Analysis of Coal," Standard D2796. In Annual Book of ASTM Standards, Vol. 05.05. New York. U.S. Environmental Protection Agency. "Clean Air Act of 1970" and "1990 Amendments to the Clean Air Act." Available from http://www.epa.gov . U.S. Office of Surface Mining. Public Law 95-87, "The Surface Mining Control and Reclamation Act of 1977 (SMCRA)." Available from http://www.osmre.gov/smcra.htm .